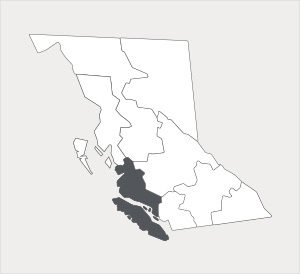 The Vancouver Island-Coast region comprises the Gulf Islands, Vancouver Island, and the central coastal mainland of BC*. With its proximity to the Pacific Ocean, water in every direction, and the beautiful mountains as its scenic backdrop the region features one of the most diverse ecosystems in the world. 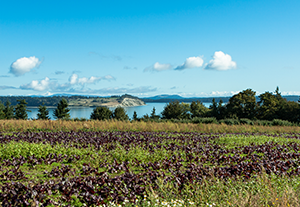 The combination of rainforests, marshes, meadows, beaches, oceans, rivers, and lakes make the Vancouver Island-Coast a unique canvas for agriculture. The mild, moist climate and short frost season means long-season specialty crops thrive here, such as kiwi fruit, organic vegetables, and wasabi (Japanese horseradish)**. The region’s 2,850 farms, almost all of which are small, have been going strong since the 1840’s. Local farmers harvest grains, potatoes, fruits, berries, nuts, mushrooms, vegetables, and greenhouse products as well as a dominant production in dairy, cattle, chickens, pigs, sheep, rabbits, and goats. The Vancouver Island-Coast also boasts a vibrant aquaculture setting for fish and shellfish***. *Source: BC Ministry of Agriculture’s 2011 Year in Review. Pg. 15. ***Source: Agriculture in the Classroom, Canada. “A Guide to BC Agriculture Resources”. Pg. 13.